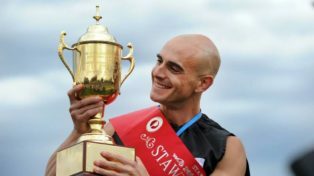 As the patron of the Stawell Athletic Club, and just the third in the club’s long history, Luke Versace gets to enjoy the Stawell Gift now in “a really wonderful way,” says the 2014 Open Gift winner. “I have, and continue to have, the privilege of meeting a lot of great people and seeing how hard they work to put on an event that has been going since the 1870’s. I also get to meet a lot of past winners and hear their stories from decades ago which is always fascinating. At the same time I get to enjoy the racing over the weekend and see the athletes go out and try to live their dreams,” said Luke. Looking forward to the 2019 Stawell Gift, Luke says that by understanding the history of the Gift and what it means to Stawell, Victoria and other parts of Australia, he sees his role is to help keep the iconic race a major Australian sporting event for generations to come. In 2017 Luke took over from previous SAC patron, William Earle, an ex- Stawell High School student and the only Olympian to have hailed from Stawell. Earle was an outstanding sprinter and represented Australia in the 1964 Tokyo Olympics as a member of the four by 100 metres relay team. He was appointed patron of the SAC in 2001. The club’s first patron was Olympic finalist and Commonwealth Games silver medallist Merv Lincoln who was appointed in 1994. Lincoln was a world class miler, becoming the 11thman in history to break the elusive 4-minute barrier. His career best of 3.55.9 was set in Dublin in 1958. Originally from Wodonga, Lincoln was a teacher at Stawell High School and he used to train on Central Park in the lead up to his final at the Melbourne 1956 Olympics. Versace ran third in the 2005 Stawell Gift final behind Joshua Ross, who famously won from the scratch mark. The 2013 season saw him under performing and overweight, but determination to give it one last shot saw him shed 12 kilograms in readiness for his tilt at the 2014 Stawell Gift. Running in the black, the then 31-year-old held on to win one of the closest finishes in the event’s 138-year history.